Well after installing the bamboo shades, there were just a few loose ends to wrap up! I want to show you a quick review of our dining room updates we’ve done so far. Installing columns in the living room! That effects the dining room a bit. We still needed to finish the crown around the column wall, and technically the original plan included adding crown all around the whole dining room, but that had to wait, since we were running short on time and cash. 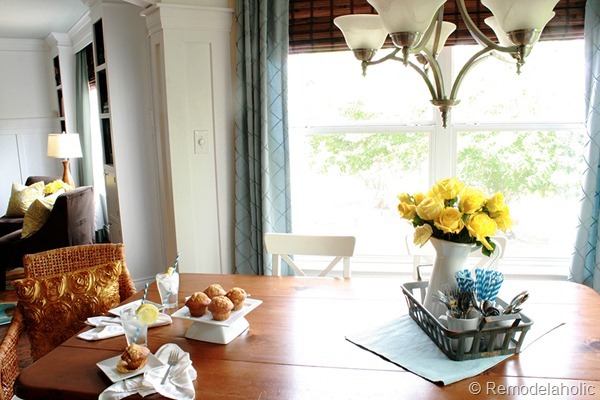 After photographing the dining room with these yellow flowers, I also fell in love with the idea of little pops of yellow throughout the downstairs space, so I changed out the pillows in the wicker chairs. and added a bunch of yellow pieces to the hutch, among other things. I love all the texture that the room had. The wood, wicker, bamboo, rug, tile, throw pillows and even the draperies the whole space had a lot of visual interest without a lot of pattern. We also needed something to ground the table, a good rug. I had a heck of a time finding a rug in time. So disclaimer, the rug we used is fine and it worked well with the living room rug, but it was not my favorite piece of rug of all time. 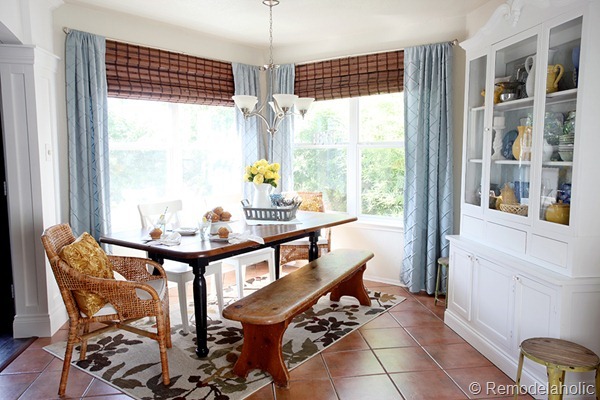 What do you think of our dining room updates? We were really happy with the space! Love love your cased openings and square colomn effect!!! I drafted this design on paper for a client’s entry, but need an actual image to show contractor. The home is a transitional style ranch and my goal is to give a more quality custom feel, so a traditional/transitional combination of cased openings with square columns is what I’ve been looking for. Your openings are a combination of both styles and this simplistic design of your colomn will help bring to life the look I want to achieve. (We won’t use the arch in this job, but I do like it.). Again, Love your large cased openings with the simple, yet understatedly elegant column style !! Well done!!!??????? ?